The bathroom floor in your store, office, or warehouse can be almost impossible to keep clean. Even after you’ve just polished it, stains and wear can make your tile or linoleum bathroom floor look dingy and dirty. Commercial epoxy floor coatings can change all of that and give you a floor that’s sanitary and easy to maintain. We manufacture our floor coating products in-house, so we can create a product that fits your own unique needs and desires. Our products are VOC free, meaning our floor coatings will release no harmful chemicals into the environment. Contact us online or give us a call at (443) 519-2628 to request an estimate for commercial epoxy bathroom floor coatings in Maryland! Prestige Floor Coating’s public restroom and wet area floor coatings are designed especially for commercial floors, with bathrooms like yours in mind. Our in-house chemists have created a product that doesn’t just adhere to the top of your existing concrete floor but actually interacts with the concrete molecules. Our formula merges to your floor, making it one solid piece instead of a floor with a coating on top. Our floors are made to last, and that’s why we offer a two-year warranty on every floor coating that we install. If your floor starts to peel or flake, we’ll replace the entire floor. Since our floors are easy to clean and lack the cracks, grout, and grooves found with tile or concrete floors, they require less maintenance work from you and are sanitary for the sake of your guests. Floor coverings from Prestige Floor Coating are also safer than traditional flooring products. The rough texture helps to reduce the chances of slips and falls, thus helping to manage your liability and worker’s compensation claims. Give us a call today at (443) 519-2628 or contact us online to schedule your bathroom floor coating appointment in Maryland. 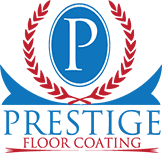 Maryland-based Prestige Floor Coating has been in business for more than 16 years, helping business owners like you create safe, clean, easy-to-maintain commercial bathroom floors. In fact, we’ve helped more than 40,000 customers with more than 30 million square feet of floor coating material in the Maryland, Virginia, Pennsylvania, and Delaware areas. To see how Prestige Floor Coating can help your business with its bathroom flooring needs, contact us today or give us a call at (443) 519-2628! Alexandria, Annandale, Baltimore, Columbia, and Gaithersburg.